How do you present Architecture to a group of 60 Year 2 pupils so that it is exciting and engaging? This was a challenge faced by one of our Architects recently when invited by a Wimbledon primary school to run a workshop with their Year 2 pupils. After a brief introduction (and rather entertaining question and answer session) the children were split up into groups and given large sheets of paper to design their own ‘dream’ home. It was amazing to see the enthusiasm of all the children and their ability to express their ideas on paper, discussing in their groups what should and should not be part of their design. To realise these fantastic ideas, the second task they were presented with, was to create physical models workshop using all the junk modelling material they could get their hands on. Considering the short amount of time and resources available to them, their determination to realise their ideas was impressive. 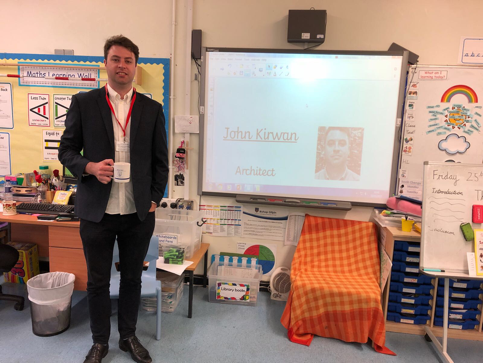 It was a very successful workshop that engaged the children, giving them a valuable opportunity to explore individual and group ideas, ask challenging and unusual questions about the profession, and hopefully sparking a more permanent interest in the Architecture and design process. It was a rewarding afternoon for all parties, and an approach HUB Architects hope to continue with in the future.